NIAGARA FALLS, ON--(Marketwire - Nov 1, 2012) - The holidays are fast-approaching, which means the time for company celebrations is, too. The Niagara Falls Marriott Gateway on the Falls offers the perfect Niagara Falls meeting space for companies and colleagues to gather for some holiday cheer, and its expert staff has great tips for making the most of your party planning. Company holiday parties are nothing new; they date back to the Victorian age and Charles Dickens' "A Christmas Carol," which depicted a party to show staff at Fezziwig's that their work was appreciated. 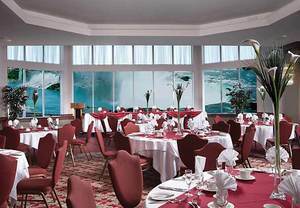 Not much has changed today, and this Niagara Falls, Canada conference center hotel is the perfect venue for companies large and small to celebrate. "The holidays are one of the few times of the year when co-workers gather outside of the work environment and can really enjoy themselves," Anthony Annunziata, vice president of marketing at this Niagara Falls wedding venue hotel, says. "A good holiday party can energize your team, instill a sense of appreciation and build morale that can last for months or even years." * Get out of the office. Your staff and coworkers will appreciate a change of scenery. * Invite spouses and significant others. Use the party to encourage more collegiality between colleagues and to build new and stronger friendships. * Provide good food. Give serious consideration to the food that will be served. * Consider audiovisual needs. The end of the year is a good time to reflect on the past 12 months. Highlight the accomplishments of your employees or share some laughs with some of the funnier stories that have happened in the workplace. Will doing so require a projector and screen, or a microphone and loudspeaker? Will there be a DJ and dancing? * Be safe. You want your staff to enjoy themselves, so think about how they will get home if they have been drinking. Look for a venue that is accessible by public transit or taxis, or even consider booking hotel rooms. The Niagara Falls Marriott Gateway on the Falls offers more than 40,000 sq. ft. of event space, including a column-less Grand Ballroom, catering services and skilled planners to assist with every detail. "The right space, the right atmosphere and the right menu are so important to a successful company holiday party," Annunziata says. "Your staff work hard all year. It is a welcome gesture to show them that work has not gone unnoticed." To learn more about hosting your holiday event at the Niagara Falls Marriott Gateway on the Falls, visit http://www.marriott.com/hotels/travel/iagmc-niagara-falls-marriott-gateway-on-the-falls/. Just 200 yards from the beautiful falls, the world-renowned Niagara Falls Marriott Gateway on the Falls offers a memorable hotel experience for families, couples and friends. This AAA four-diamond hotel is directly across from the Scotiabank Convention Center and steps from the Fallsview Casino, making it easy to spend an entire weekend or week here exploring the area. Guestrooms and suites at this five-star property offer views either of the city or falls, and are outfitted with comfortable, luxurious bedding; coffee/tea service; high-speed Internet; 37-inch LCD TV and individual climate control. Family suites, two-story lofts and presidential suites offer extra-special stays and plenty of space. Amenities at this green-certified hotel run the gamut from an indoor pool and fitness center to more than 40,000 sq. ft. of flexible event space. In-house dining includes a globally inspired menu with a view at Fallsview Milestones Grill & Bar, Starbucks and the Great Room Lounge & Bar. The Niagara Falls Marriott Gateway on the Falls offers the perfect Niagara Falls meeting space for companies and colleagues to gather for some holiday cheer, and its expert staff has great tips for making the most of your party planning.